Found 2 file extension associations related to WinCDG Pro and 1 file format developed specifically for use with WinCDG Pro. 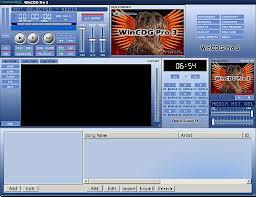 WinCDG Pro is the rebirth of this classic line with support for the new operating systems (this includes Windows Vista). WinCDG Pro can play karaoke, video, and audio. It will play CD+G and CD-Audio discs. It also includes the basic import (or "ripping") from CD+G to MP3+G. WinCDG Pro continues to include the fast CD+G and MP3+G playback routines and the feature that first made is famous, the direct CD+G Disc playback. Have a look at the new features now included in this new release and enjoy the eclectic mix of the features carried from the original. The WinCDG Pro software seems to be old or discontinued. If you need more information please contact the developers of WinCDG Pro (TriceraSoft), or check out their product website.